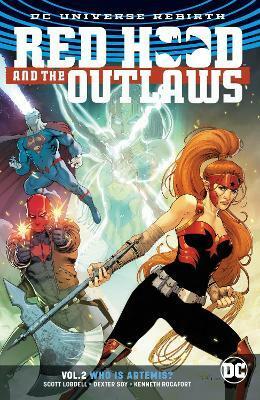 Writer Scott Lobdell (SUPERMAN, TEEN TITANS) and artist Dexter Soy (RED HOOD/ARSENAL) shed fiery light on the Outlaws' most mysterious member in RED HOOD AND THE OUTLAWS VOL. 2: WHO IS ARTEMIS? Little is known about the Amazon warrior Artemis, even by her teammates in the so-called "Outlaws." But Red Hood and Bizarro are about to get a crash course when her past comes back to haunt all three of them--with a vengeance! Soon the team finds itself a long way from the streets of Gotham in Qurac[AR1] . Not only is the war-torn Middle Eastern country Artemis' former home, it's also the site of great personal tragedy for both the wayward Amazon and for Red Hood. It was in Qurac where Artemis lost her best friend, and where Jason Todd got himself murdered by the Joker, back before Robin became the Red Hood. Now someone in Qurac is using the ancient weapon of Artemis' people--the Bow of Ra--to commit genocide, and only an Amazon can tame its incredible power. But stopping the Bow means marching right into the middle of a war zone...and in a war between Amazons and mankind, whose side will Artemis take? Collects RED HOOD AND THE OUTLAWS #7-11. Scott Lobdell is a veteran of the comic book industry, having worked with nearly every major American comic book publisher. Lobdell is best known for his work on Marvel's X-Men franchise in the 1990s, penning such works as UNCANNY X-MEN, EXCALIBUR, THE AGE OF THE APOCALYPSE and GENERATION. He is currently the writer of RED HOOD AND THE OUTLAWS, as a part of DC Rebirth.